"Lines of Labour: Representing the Labouring body in Victorian graphic art"
The drawn, engraved or etched line was one of the main tools used to depict the labouring body in the nineteenth century either to confirm prejudice and cliché or to become a line of flight offering new paths for reimagining the body at work. Labour occupied a prominent position in Victorian public discourse; when the Reform Bill of 1832 reinforced the position of the mercantile middle-classes, rhetorical constructions increasingly associated business and industry with power and respectability. Following the values of evangelical Christianity, and thinkers such as Thomas Carlyle, work became a form of worship (‘Laborare est Orare’, Past and Present, 1843). It was also an instrument of self-improvement and social mobility as we see in Samuel Smiles, whose Self-Help (1859) was an instant success. Left: by Well Bell Scott. 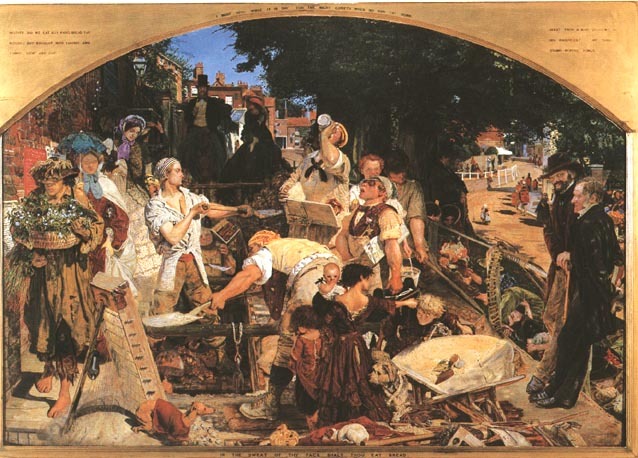 Right: Work by Ford Madox Brown. Click on images to enlarge them. The body at work was also a working-class body, straining, leaning, wielding hammers or pickaxes or blowing glass; a body celebrated by industrial capitalism as an icon of progress and improvement. 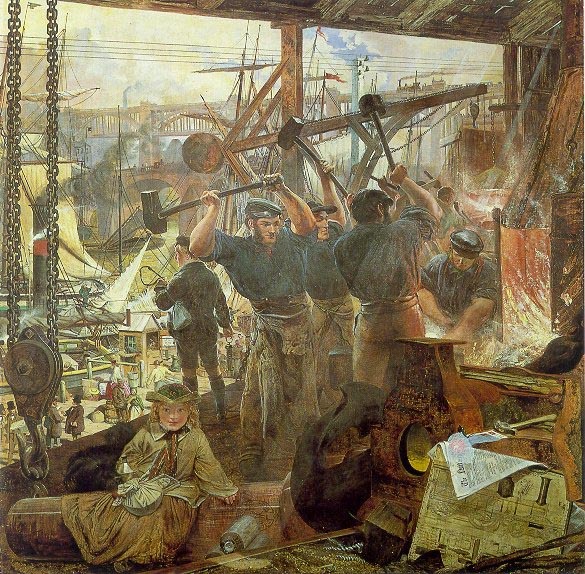 We see this in Iron and Coal (1855–60) by William Bell Scott which illustrates the central role of coal, iron and manual work in the heavy engineering projects they made possible or Ford Madox Brown’s Work (1852-65) with its aestheticized city labourers. The working body in this context is sculpted, often geometric or heroic and sometimes close to the bodies of socialist realist iconography of the 1930s. At the same time, government reports and statistical papers were also testifying to social distress which permeated literary and artistic production: Henry Mayhew, Charles Dickens or Elizabeth Gaskell provided a degree of visibility to hidden social plights, their writings often accompanied by illustrations of impoverished workers. A range of visual media tackled the ‘condition of England’ question depicting the more disturbing aspects of the industrial age, ranging from Thomas Hood’s “Song of the Shirt” in Punch (1843) to Richard Redgrave’s poignant Sempstress (1846) and G. F. Watt’s many social subjects. There also existed distinct ‘conditions of the country’ issues, which focused on the Welsh, the Scots, and the Irish from a double angle: their specific, distinct presence in Britain's (if not England's) large cities, and their predicament in their country or province of origin. Britain was also constituted through its colonial ‘others’ whose labour could be included or excluded from the visual community of the nation; be they servants, merchants, preparers or sellers of opium, labourers, lascars, tailors or sailors the worker from the colonies was increasingly shown as an everyday part of British towns and cities. Boosted by the revival of wood engraving and now catering to a rapidly expanding market, the pictorial press provided an extensive visual coverage of these questions. In the major cities of the Empire, the depiction of the labouring body was part of the cultural hegemony which policed the invisible borders of class and nation but also questioned those borders. In The Illustrated London News (1842-1989) and its competitors, the Pictorial Times (1843-48) or Henry Vizetelly's Illustrated Times (1855-72), many of whose readers formed part of an earnest and reformist upper middle-class, full-page images commissioned from leading artists addressed industrial issues, depicting male, female and child workers through various aesthetic filters. Simultaneously, the progressive repeal of the “taxes on knowledge” (advertisement duty was repealed in 1853, paper duties in 1861) allowed the working-class, which had long been excluded from the purchase of stamped publications, to enjoy high-quality illustrated periodicals like The British Workman (1855-1921) or its female counterpart, The British Workwoman (1863-96) where didactic representations of labour designed to promote “temperance, religious observance, industry and thrift” (DNCJ 80) were privileged. Finally, although such magazines as Good Words (1860-1911), Once a Week (1859-80), or Thackeray’s Cornhill Magazine (1860-1975) adopted a more literary approach, they also included a wide range of articles on science, art, travel and items of social and cultural interest, providing other visual perspectives on manual, intellectual, rural or urban work. London Punch, Punch or the Sydney Charivari, Hong Kong Charivari, the burgeoning print trade in Calcutta and the many periodical publications of countries such as South Africa, Ceylon, Malaya, Singapore,and the West Indies all depict forms of labour be it paid-labour or forms of slavery. These images often constitute a championing of imperialist values but also a critique of the suffering of the colonial body. In all these publications, art and labour therefore seem to be engaged in a constant dialogue, sensitive to the specific context in which they took place. Throughout the second half of the nineteenth century, the use of wood engraving as a cheap and flexible means of reproducing images radically changed the nature and production of graphic designs. “What had formerly been a craft became an industry,” Goldman and Cooke remark in Reading Victorian Illustration, 1855-1875 (2012), “with large-scale engraving companies like the Dalziel Brothers and Swain running expensive and powerful operations” (34). With the introduction of electrotyping, which made it possible to copy the woodblock onto hard metal, and the increasing fragmentation of the engravers’ job, a number of highly skilled craftsmen felt threatened by mechanization. In 1869, the launch of The Graphic (1869-1932), another lavishly illustrated periodical, reflected these developments. Published by William Luson Thomas, a former assistant to the engraver William James Linton, supporter of radical causes and Chartist sympathiser, the new weekly offered a distinctive approach to news illustration based on a progressive treatment of its draughtsmen and engravers who were not to be regarded as factory workers, but as artists, and even owners (Korda, Printing and Painting the News, 50). The idea of visually confronting readers to harsh toil, therefore, not only concerned the subjects represented, but also the professionals who conceived, designed and physically produced the prints, many of them women, some of whom remained completely unacknowledged. At a time when decades of industrialisation were redefining art, artists and artisans, the ‘distribution of the sensible’, to borrow Jacques Rancière’s term, was a real and pressing question. The intersection between labour, aesthetics and politics will be considered through questions such as the ‘white line v. facsimile’ question, but also the large number of other technologies used by Victorian graphic artists like lithography, steel-engraving, and other intaglio methods which not only changed the way men and woman worked but also how labour in general was depicted. Finally, online labour and the issues surrounding digitalisation as a form of the persistence of Victorian lines of labour will be of interest. Academic work is also a form of labour and the digitalisation of nineteenth-century resources changes our own gestures and lines of labour. The object of this one-day symposium at Caen Normandie University is therefore to examine the intricate exchanges between image, body and labour in the Victorian era, the nature, scope and stakes of representations of labour as well as the social, economic and cultural conditions in which these depictions were produced. What degree of visibility did the Victorian press provide for manual, industrial, colonial, intellectual labour and for what purpose? Do we find workers in Britain and the Empire seizing the means of (re-)production to produce their own images of labouring selves or fellows – a sort of proletarian night like that Rancière describes in La nuit des prolétaires: archives du rêve ouvrier? How did visual culture influence the way in which objectivity – ‘fixing the reality’ of work – was defined in the nineteenth century? Questions concerning the reception of images will also be explored, as well as the ideologies underlying their design, circulation and possible subversion. From the docile or suffering body that stands in line or toes the line to the heroic body of industry or dissent, graphic art played a crucial role in showcasing epistemological negotiations between belief, knowledge and truth. Of particular interest is the idea that the drawn labouring body might help reveal new ‘structures of feeling’ (Raymond Williams), a shift in paradigm as part of a particular historical conjuncture. A second one-day symposium will take place at the University of Paris in 2020 and will move the subject to include other medial forms. Images of labour and the (re)definition of the political nation. The digital challenges of 19th c. techniques: etchings, engravings online. Anderson, Patricia. The Printed Image and the Transformation of Popular Culture: 1790-1860. Oxford: Clarendon Press, 1991. Curtis, Perry. Visual Words, Art and the Material Book in Victorian England. London and New York: Routledge, 2002. Barringer, Tim. Men at Work. New-Haven and London: Yale University Press, 2005. Beaumont, Matthew, Utopia Ltd. Ideologies of Social Dreaming 1870-1900. Leiden: Brill, 2005. Beegan, Gerry, The Mass Image. A Social History of Photomechanical Reproduction in Victorian London. Basingstoke: Palgrave Macmillan, 2008. Brake, Laurel and Marysa Demoor (Eds.). Dictionary of Nineteenth-Century Journalism. In Great-Britain and Ireland. Gent and London: Academia Press and The British Library, 2009. Carré, Jacques, La Prison des pauvres. L’Expérience des workhouses en Angleterre. Paris: Vendémiaire, 2016. Chaudhuri, Amit. Clearing a space: reflections on India, Literature and Culture. Oxford: Peter Lang, 2008. Cooke, Simon. Illustrated Periodicals of the 1860s. Contexts and Collaborations. London: The British Library, 2010. Didi-Huberman, Georges. Survivance des lucioles. Paris: Minuit (Paradoxe), 2009. Didi-Huberman, Georges Désirer, désobéir. Ce qui nous soulève. volume 1, Minuit, 2019. Fox, Celina. Graphic Journalism in England during the 1830s and 1840s. London: Garland, 1988. Gagnier, Regenia. Subjectivities: A History of Self-Representation in Britain, 1832-1920. Oxford: OUP, 1991. Gagnier, Regenia. The Insatiability of Human Wants: Economics and Aesthetics in Market Society. Chicago and London: The university of Chicago Press, 2000. Golden, Catherine J. Ed. Book Illustrated: Text, Image, and Culture 1770-1930. New Castle, Del. : Oak Knoll Press, 2000. Goldman, Paul and Simon Cooke Eds. Reading Victorian Illustration, 1855-1875. Spoils of the Lumber Room. Farnham: Ashgate, 2012. Hall, Catherine, Keith McClelland, and Jane Rendall, Defining the Victorian Nation Class, Race, Gender and the British Reform Act of 1867. Cambridge: CUP, 2000. Hatton, Joseph. Journalistic London. London: Sampson Low, Marston, Searle & Rivington, 1882. Hewitt, Martin. The Dawn of the Cheap Press in Victorian Britain.. London: Bloomsbury, 2014. Hobbs, Andrew. A Fleet Street in Every Town. Cambridge: Open Book Publishers, 2018. Jackson, Mason. The Pictorial Press: its Origins and Progress.. London: Hurst and Blackett, 1885. Hobsbawm, E. J. Industry and Empire. Penguin:  1990. Horner, Avril, and Angela Keane. Body Matters: Feminism, Textuality, Corporeality. Manchester University Press, 2000. Kaenel, Philippe. Le Métier d’illustrateur 1830-1880 Rodolphe Töpffer, J. J Granville, Gustave Doré. Paris: Genève: Librairie Droz, 2005. Korda, Andrea. Printing and Painting the News in Victorian London. The Graphic and Social Realism, 1869-1891. Farnham: Ashgate, 2015. Maidment, Brian. Comedy, Caricature and the Social Order 1820-50. Manchester: MUP, 2013. Mussell, James. The Nineteenth-Century Press in the Digital Age. Basingstoke: Palgrave Macmillan, 2012. Rancière, Jacques. La nuit des prolétaires: archives du rêve ouvrier. Paris, Fayard, 1981. Rancière, Jacques. Le Partage du sensible: Esthétique et politique. Paris: La Fabrique, 2000. Spivak, Gayatari. “Can the Subaltern Speak?” in Cary Nelson and Larry Grossberg, eds. Marxism and the interpretation of Culture. 1988. Sinnema, Peter. Dynamics of the pictured page: representing the nation in the “Illustrated London News”. Aldershot: Ashgate, 1998. Slauter, Will. Who Owns the News? A History of Copyright. Stanford University Press, 2019. Thomas, Julia. Nineteenth Century Illustration and the Digital. Studies in Word and Image. Palgrave, Macmillan (eBook), 2017. Thomas, Julia. Pictorial Victorians. Athens, Ohio: Ohio Press University, 2004. Treuherz, Julian. Hard Times. Social realism in Victorian art.. London: Lund Humphries, 1987. Vann, J. Don and Rosemary T. Van Arsdel, Eds. Victorian Periodicals and Victorian Society. Toronto: University of Buffalo Press, 1994. Williams, Raymond. The Country and the City. London, Chatto and Windus, 1973. Reprinted, London, Hogarth Press, 1985. Williams, Raymond. Marxism and Literature, Marxist Introductions Series. London and New York, Oxford University Press, 1977. Deadline for submission: 1 July 2019. Notification of acceptance: 15 July 2019. Proposals of around 250 words, together with a short bio, should be sent to Anne-Catherine de Bouvier (anne-catherine.debouvier@unicaen.fr), Françoise Baillet (francoise.baillet@unicaen.fr) and Sara Thornton (sara.thornton@univ-paris-diderot.fr).